The Primary has passed and the stage is now set for the November election. 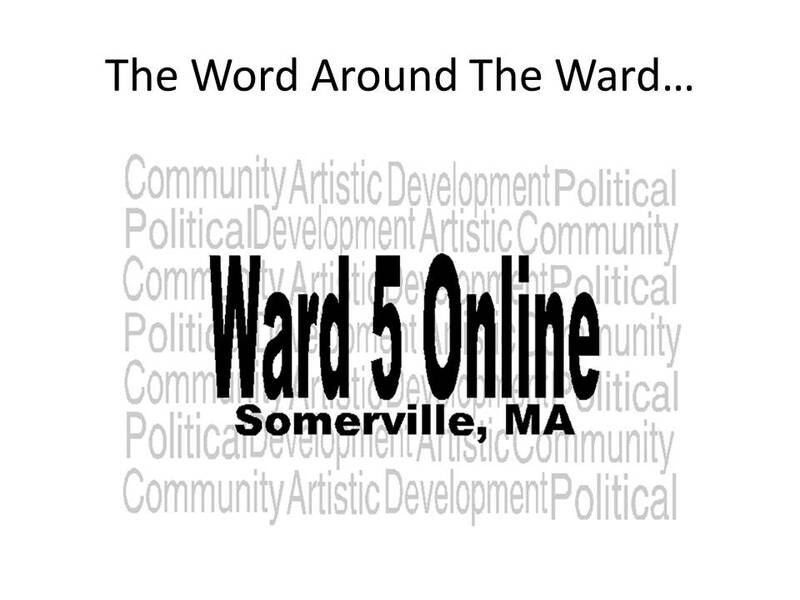 In the coming weeks, Ward 5 Online will outline where the races are and give you an opportunity to make your predictions. PennyPackers are ready to rock in Magoun Square and will be making their debut sometime next week. If you see the door open, do stop by and welcome them to the best business district in Somerville. Another 15-minute parking spot will be piloted in Magoun Square in the coming months. Located in front of 514 Medford Street, the issue will be taken up again in December to see if it is adapting well in the square. Olde Magoun’s Saloon is bringing back the Paulaner Oktoberfest Biergarten, this time, making it a 2-day event on Saturday October 5th and Sunday October 6th from 12-6pm! Paulaner is bringing an 18-wheeler truck outfitted with functioning taps and filled with each beer they produce including Oktoberfest Marzen, Oktoberfest Weisn, Pilsner, Lager, Hefeweizen, Salvatore Doppel Bock. They'll have a tent, biergarten picnic tables, music and authentic Oktoberfest food to go along with all the great beer. This is going to be the Oktoberfest event of the year you don’t want to miss! Residents gathered at the Walnut Hill Auto Body Shop last night to get a first glimpse at a proposal for 6 units on the site. This development is the first of two that are being pitched to neighbors with more units being suggested for building directly next door. More meetings on the projects are being scheduled to allow neighbors an opportunity to offer recommendations and voice concerns. By "next door" do you mean where the glass company extends east out of where the Walnut Hill Auto Body is? Or, where the building that houses Boston Closet is? South, across Woodbine St. Actually 229 Lowell. How many residential units being proposed for the second parcel development? Also, who is the developer for the six units proposed for where Walnut Hill Auto now stands? The same developer for both parcel proposals??? No formal proposal has been submitted to the public as of yet. No, it is not the same developer. I was told by a resident that 215 Lowell Street was once a complete building unto itself with only one company filling the entire building. Albeit, on two separate parcel lots. Then subsequently broken up/walled up to accommodate more than one tenant, including the current auto body shop and the glass company. If true, not sure if it was done legally or not. Excuse me, but are saying you cannot divulge one or both developer's names or organization; or,do not know one or both names/organization at this time? If the latter, as a ward alderman, hard to believe if true. Doesn't their names/organizations come under "public information?" No, I am not saying that at all. Ed Doherty is developing 235 Lowell Street. I don't know who is developing the other location as nothing has been presented yet. I won't be able to go the meetings, but I always assumed development was on the way for those parcels. Any chance either of them can have commercial development on the ground level? A coffee shop in particular would be great next to the impending green line station and would draw much traffic from Maxwell's Green. Don't forget that as we develop we want to have tight-knit communities that include healthy foot traffic. Dense neighborhoods can have corner stores too, not just squares. Thoughts? Ground level commercials, Not only corner stores, but mid-block stores---all with one or more residential units above them; were very common years ago in very high density Somerville; including the subject neighborhood being discussed on this thread. But to have one or more ground level retail outlets at the subject proposed condo site would add another level of height for the proposed six condos to become a reality. by way of obscured views, blocking the sun. etc. Might also negatively impact (lower)the selling prices for the condos appeal to potential buyers.